The memorial was dedicated at Cooper River Park’s Memorial Grove in 1998. Last Sunday marked 75 years since the Bataan Death March. Sunday, April 9, marked 75 years since the Bataan Death March. The event took place during World War II following a battle between Japanese troops and Allied forces. A three-month long battle near the Bataan peninsula in the Philippines took place in early 1942 between a joint force of Filipino and American troops and the Japanese Imperial Army. On April 9, 1942, the allied forces surrendered to Japan. The Japanese Army gathered about 66,000 Filipino and 12,000 American prisoners of war and forced them to endure a 65-mile walk to prison camps. The walk later became known as the Bataan Death March after thousands of POWs died during the walk. The number of memorials dedicated specifically to the Bataan Death March are few and far between. Multiple sources state only one memorial dedicated to the event exists in the northeastern United States. That memorial is located in Cherry Hill. The second memorial is dedicated to the Bataan Death March. Sitting closer to the sidewalk and street, the memorial includes a description of the event as well as a map detailing the path the POWs took during the death march. Each year, to commemorate the anniversary of the march, a ceremony is held at the memorial. This year’s ceremony was held last Sunday. Both memorials were dedicated in June of 1998 coinciding with the 100th anniversary of the Philippines declaration of independence from Spain. The Bataan Death March Memorial was renovated about five years ago. According to a September 2012 newsletter from the Filipino Executive Council of Greater Philadelphia, the council renovated the monument at a cost of $6,000. The renovation helped repair the memorial, which has shown signs of wear and tear. Both the Jose Rizal Monument and Bataan Death March Memorial are part of a section of Cooper River Park named Memorial Grove. Memorial Grove is home to a line of various memorials along the north bank of Cooper River Park. 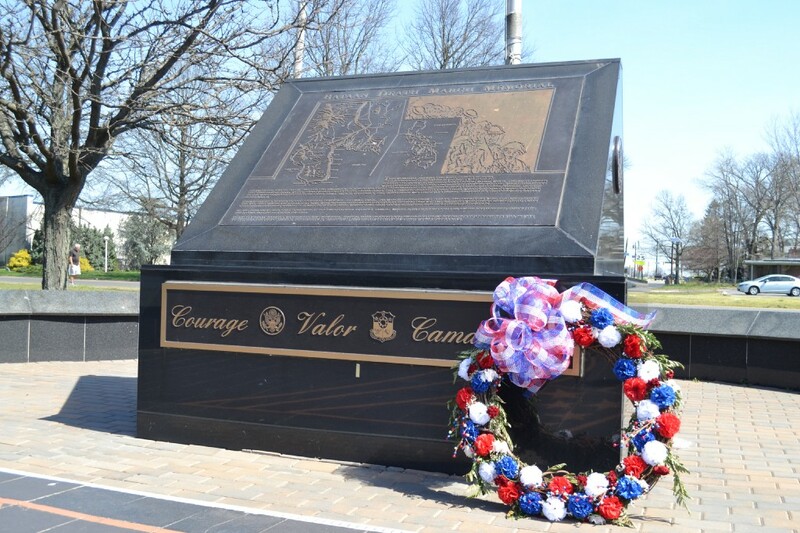 Check back with the Cherry Hill Sun in the future for more Throwback Thursday features on Cooper River Park’s memorials.